Apples are definitely one of my favorite baking fruits. One. of. my. FAVORITES. See, this might be kind of weird to emphasize, as I am sure many others love baking with apples and eating apple desserts. But I am very weird when it comes to apples in general. I just simply do not eat apples or drink apple juice. For some absurd reason, I just do not like eating apples or drinking apple juice, but give me an apple related dessert and I am PRETTY sure I will eat it. ALL of it. I am serious. Thus, today I will share my experience with making apple crisp. 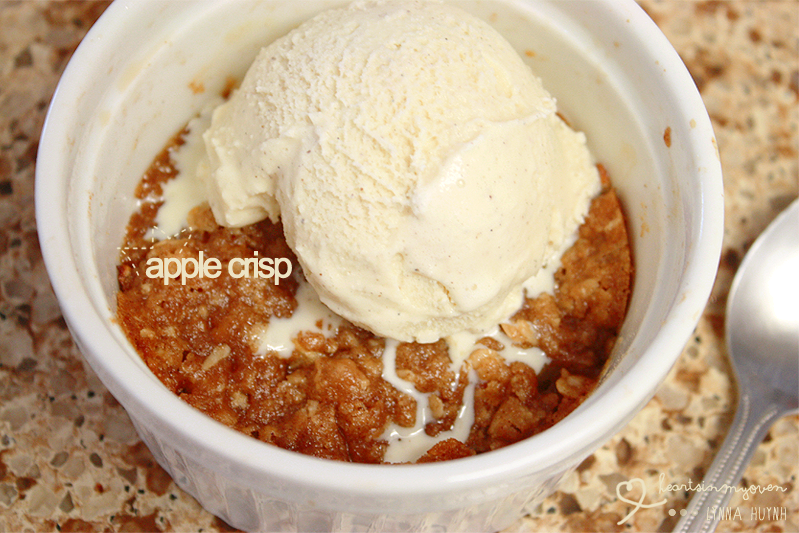 I have found many recipes for apple crisps, but I just cannot eat 12 servings of apple crisp by myself. Well, I can...but I will not allow myself to because in all seriousness, I need to save room for other desserts. I settled on this one recipe from Completely Delicious and it was indeed delicious! The serving size was good, the recipe was easy to follow, and it was pure joy to eat. I made these in four (8oz) ramekins instead of one 8inch baking dish like the original recipe. The apple crisp came up to just half of my ramekin, so if you want to serve one big 8oz serving of apple crisp, I suggest splitting the recipe to only two ramekins instead of four. However, because I bake so much and my friends and family can only eat so much without hating me for making them gain weight, I prefer to share smaller serving sizes. I also made this recipe using two Granny Smith apples. My opinion on this recipe? VERY YUMMY! I seriously finished it in like 3 minutes and so did my friends. Of course I had to add some vanilla ice cream on top to go with it!